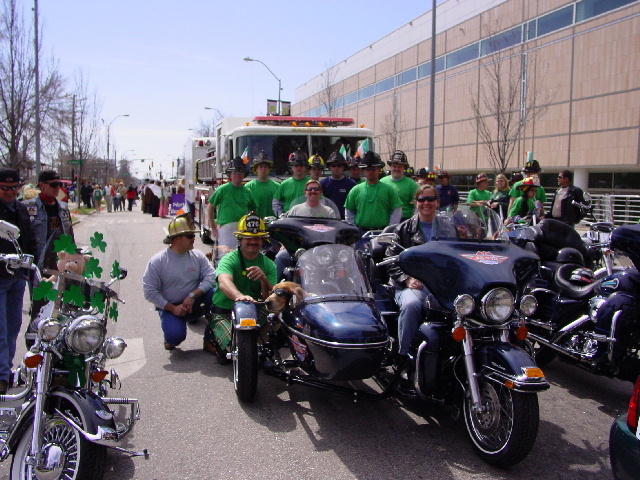 The U.S. Hogs For Dogs team wishes everyone a Happy St. Patrick's Day. After the week we've had, I have to believe that Max & Bailey once visited the 15th century Blarney Castle and kissed the Blarney Stone. The legend says that anyone who kisses the stone is henceforth endowed with the gift of eloquence and persuasive flattery. And there's no better description of how people around the country have responded to Max & Bailey's big debut on TV and through our educational partnership with Global SchoolNet. 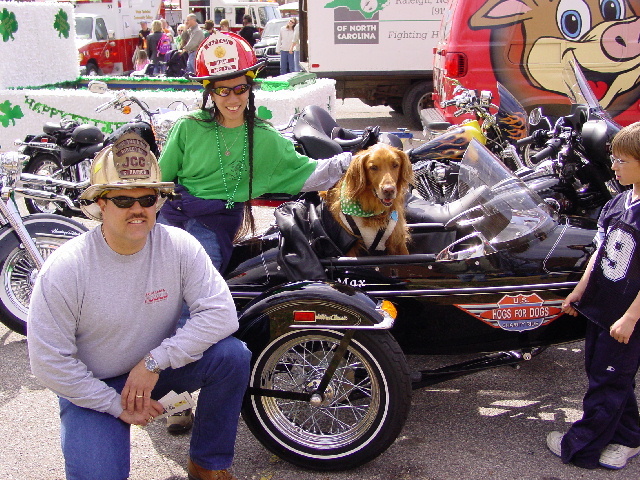 On Wednesday, March 10th, Raleigh's WRAL TV-5 aired a story about Max & Bailey's upcoming charity ride across America. It was such a popular story that it has now run at least three different times that we're aware of, maybe more. You can see the 90-second video online at http://www.wral.com/video/2913344/detail.html. Following on the heels of the WRAL story, we received another interview request from WWAY News Channel 3 - Wilmington, NC. So this past Sunday, we spent three hours talking with WWAY's Amber Zeller and filming footage for a piece that will run later this month. 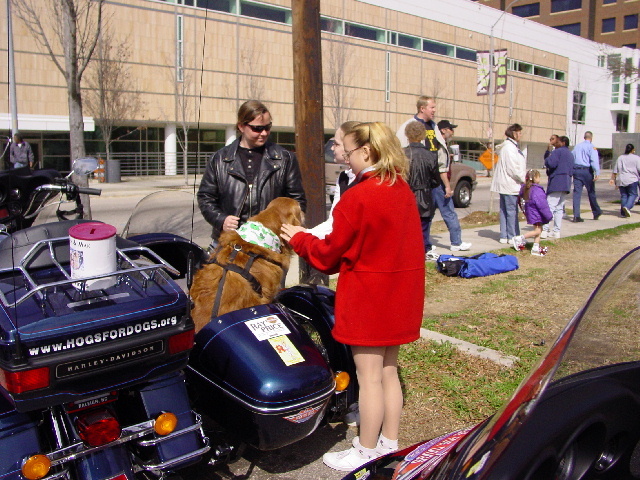 In addition, Amber wants to have the Hogs For Dogs team make several calls from the road while we're on the seven-month journey across the country. The calls will be aired on the nightly news as part of a "Where are Max & Bailey" segment. So, if you live in the Wilmington area, look for us on News Channel 3 and we'll be sure to post the story on our Press Releases page as soon as it becomes available. This week was also a banner week for schools requesting a visit from Max & Bailey. Our first school presentation will be at Benson Elementary School on Thursday, March 18th. And with the launch of our partnership with Global SchoolNet, our phones are ringing off the hook with requests from around the country. We've already added several of the schools to our planned route during the school year and are asking our charity partners to consider making a presentation where we can't. Many schools have also asked about fundraising opportunities as part of our visit. 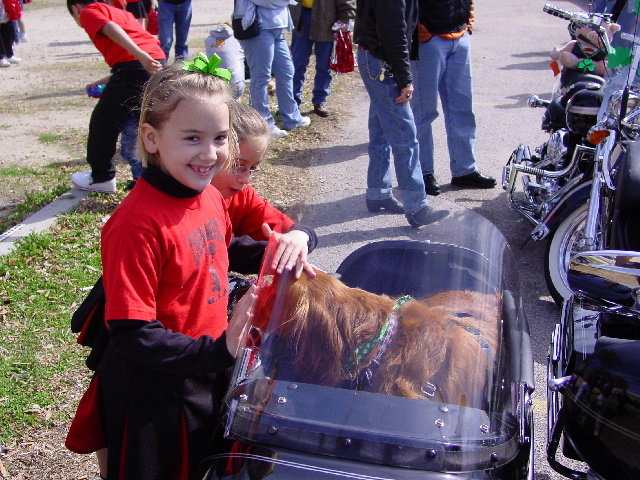 To address those requests, U.S. Hogs For Dogs has laid the groundwork for two new programs aimed at getting kids more involved in Max and Bailey's charity ride. The first program will be called Max & Bailey's "Road to Reading" program and will encourage reading as a way to raise donations through pledges. 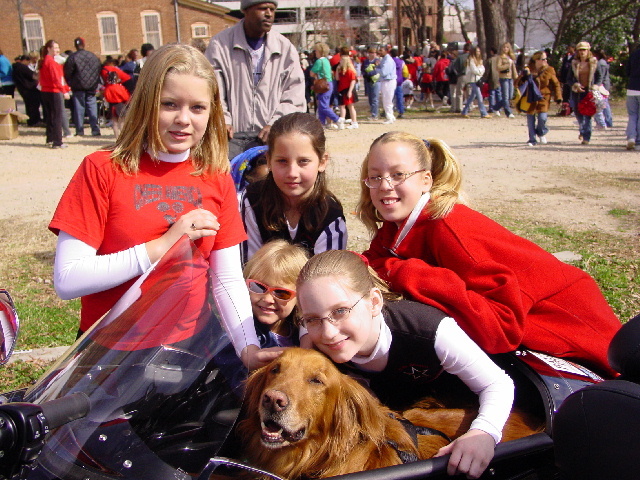 The second program is called Max & Bailey's "Dimes For Dogs" Campaign, where children simply collect spare change to help people with disabilities live more independent lives. 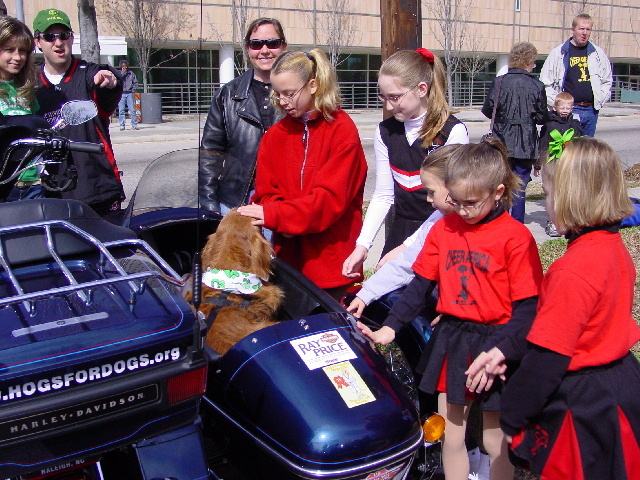 Both programs help teach children about the importance of charitable giving within their communities. Wouldn't it be wonderful if the children raised more money than their parents? It could happen. 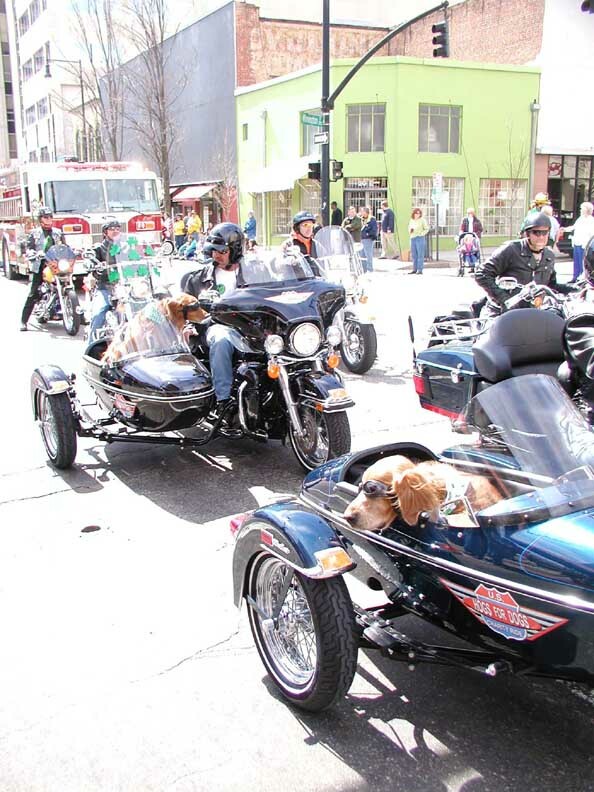 But, the biggest story of the week was Max and Bailey's ride in the Raleigh St. Patrick's Day Parade. 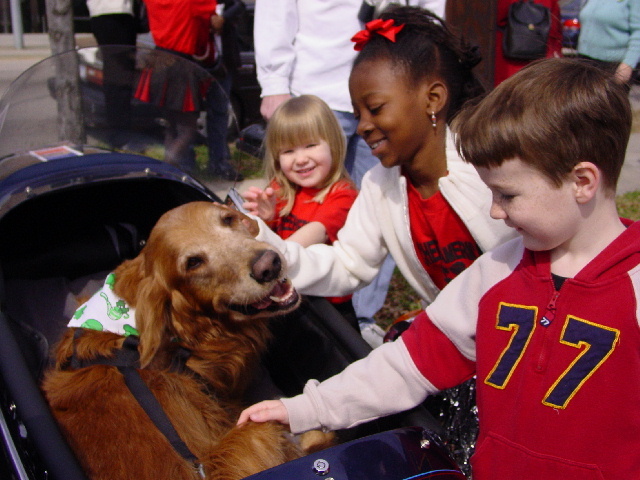 Before the parade, Max and Bailey were the star attraction for several hundred kids and adults. The dogs just soaked up all the attention with the grace of real celebrities. 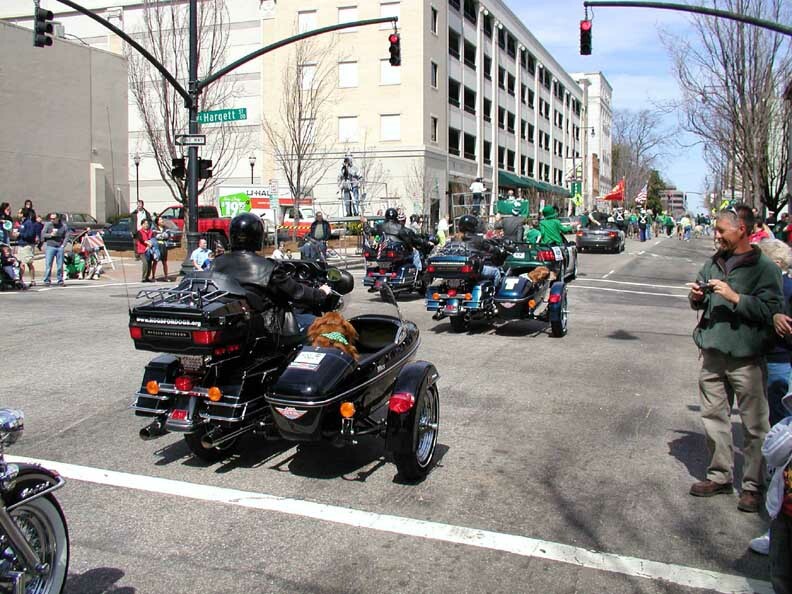 We had been invited to be a part of the parade as part of the Raleigh Harley Owner's Group and were expected to be in the #11 spot in the parade. 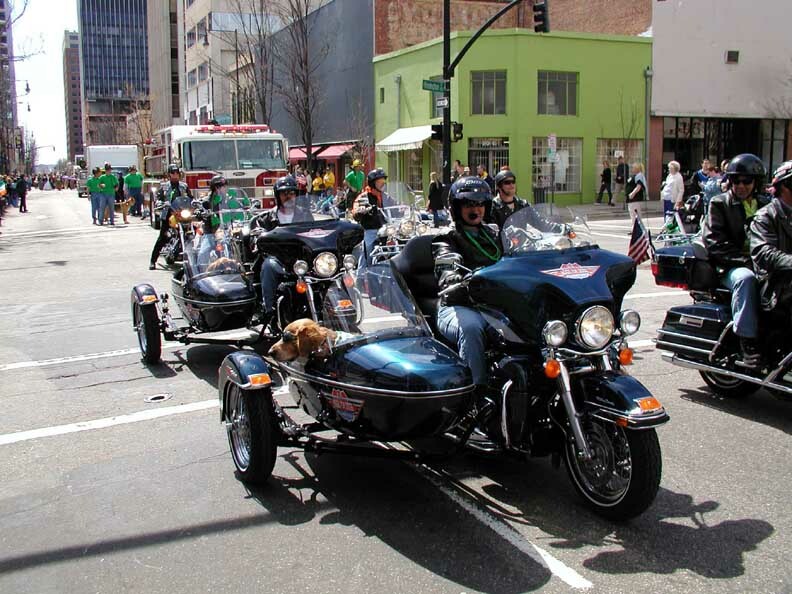 Well, somehow in all the parade confusion, the Raleigh H.O.G. 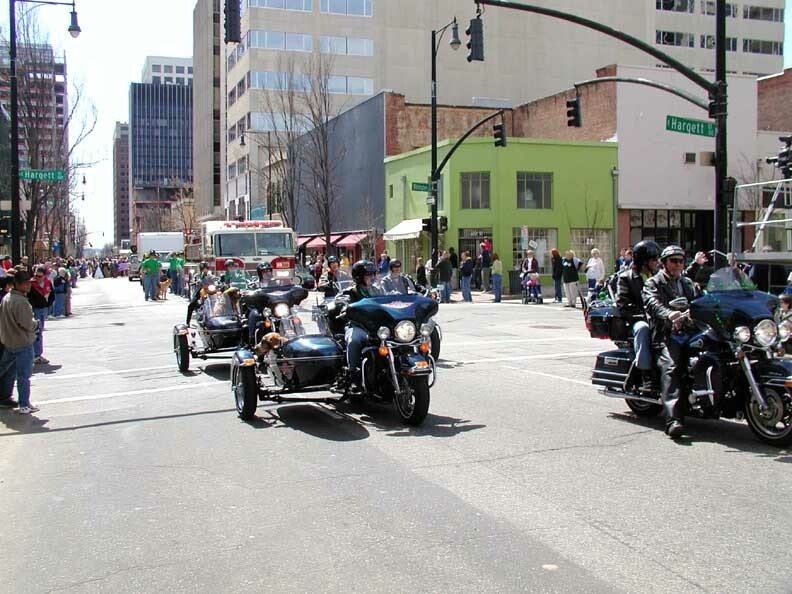 group landed in the #3 position, right behind the Parade's Grand Marshall and Raleigh's Mayor, Charles Meeker. The Grand Marshall, none other than NBC 17's Bill Gaines, spent several minutes talking with us about the upcoming charity ride while Bailey enjoyed lots of Bill's loving attention. 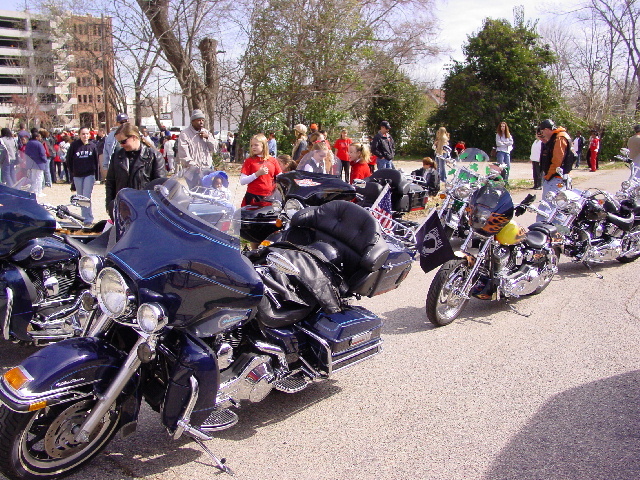 And the icing on the cake was when Bill promised to join us on the May 1st ride out of town. 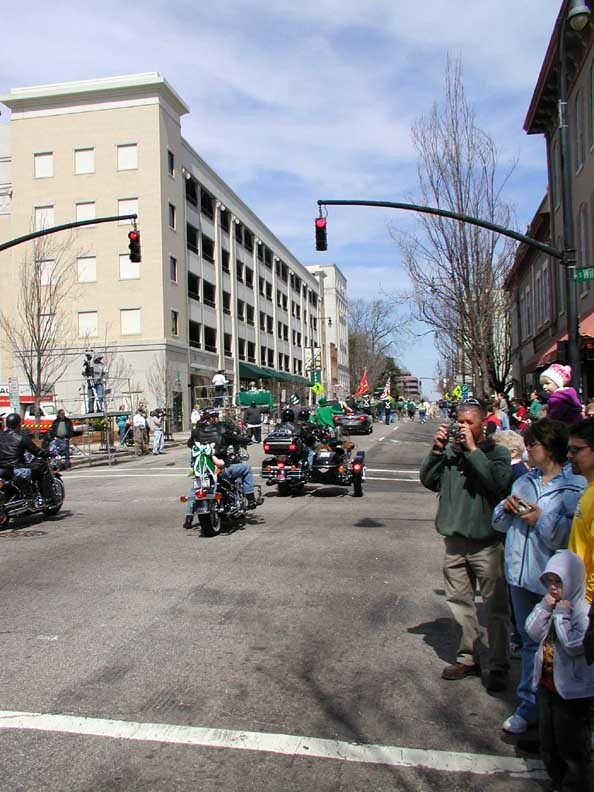 Thousands lined Raleigh's downtown streets to cheer and watch the parade. 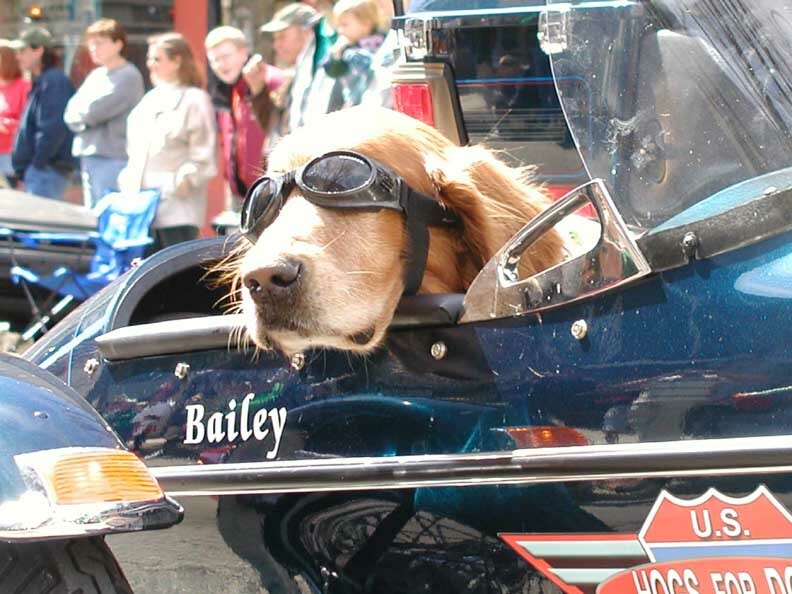 And, when the bagpipes announced the beginning of the parade march, Max & Bailey were right up near the front, smiling and wagging their tongues while wearing their goggles. The reactions were the same everywhere we looked: smiles, laughs and cheers for Max and Bailey - the dogs they saw on TV. The next thing you know, Max and Bailey will want their own agent! I'll close this entry with a St. Patrick's Day thought: If you travel to the Blarney Castle in county Cork of Ireland, be careful when kissing the Blarney Stone. You may find that there's a little dog slobber still on the stone from Max & Bailey's big good luck kiss.